The best way to introduce new players to baldorf is by teaching them something else entirely. Pigdorf is the most popular variation of baldorf and learning this game is the first step to becoming a baldorf Master. Below are the rules for this variation. Any number of players can compete with creative shots while trying to avoid gaining the letters P-I-G. The first player attempts a creative shot with a dorf, anywhere and anyhow (be sure to thoroughly explain each shot). If the player misses their attempt the next player attempts to make a creative shot of their own. This continues until a shot is made. When a player successfully makes a shot, all other players must complete the same shot. Players failing to complete the shot receive a letter, the first being P…. When a player misses a shot that would give them the letter G they can “Prove It” by attempting the same shot a second time. If the player proves it, they are still in the game with only two letters. If they miss, they can no longer participate and have just been PIGGED OUT! During the game there are no warm up shots, dribbling is ok, but any shot counts as a turn. Players who are not currently shooting can practice. Pigdorf score sheets can be made on any piece of paper, and we here at MRP encourage recycling. 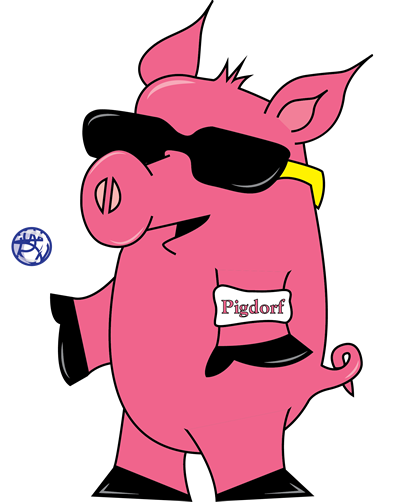 But if you want the real deal, download official Pigdorf score sheets here.